An eclectic group of local Columbia musicians has joined forces to pay tribute to the late outlaw-country legend, Waylon Jennings. 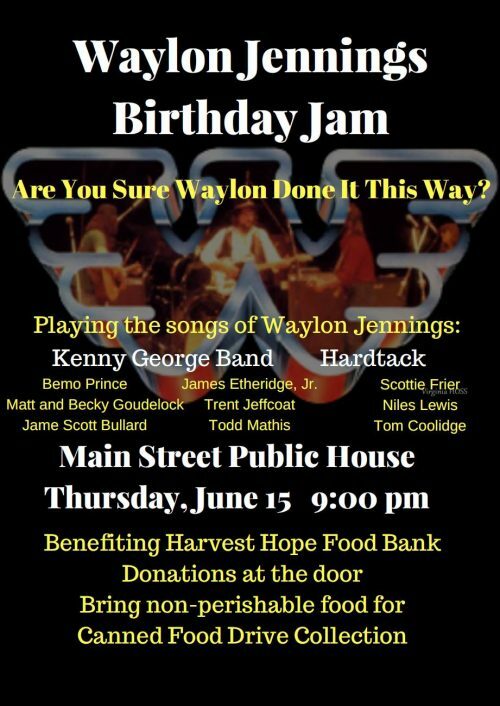 The concert event, called the Waylon Jennings Birthday Jam, takes place on what would have been his 80th birthday, Thursday, June 15th 2017 at the Main Street Public House. The event is a benefit for Harvest Hope Food Bank, and attendees are requested to bring two canned goods, or make a monetary donation at the door, in lieu of admission charges. All food and money collected during the evening’s performance will go to feed hungry families locally in the Columbia area. 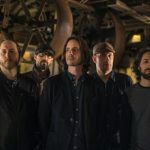 Show organizer and host, Kevin Oliver of Nuts and Bolts Promotions, has enlisted the talents of a blockbuster list of bands, solo acts, and guests, and he promises some special surprises. The announced lineup includes Hardtack, Kenny George Band, James Scott Bullard, Bemo Prince, Todd Mathis, Matt and Becky Goudelock, Trent Jeffcoat, BJ Brazzell, Buck and Rhonda Mooneyhan, Scottie Frier, Tom Coolidge, Niles Lewis, Ashley Hayes and more.